Many online photo editors are advertised as the browser-based equivalent of Photoshop, but most of them are actually very limited compared to Adobe's industry-leading software. For serious photo editing, stickers and filters aren't nearly enough – you need access to layers, customizable brushes, masks, curves and much more. The very best online Photoshop alternatives can also open and export in Adobe's native PSD format, allowing you to collaborate with users of the desktop software, or continue working on the same file at a later date. With that in mind, here's our guide to the best online Photoshop substitutes – ideal if you need to get some graphic design done on the move, or don't have the cash for the desktop software at the moment. Photopea's unique selling point is its ability to open and export Photoshop PSD files – an unusual and extremely useful feature. It also uses the same keyboard shortcuts as Photoshop, making the transition from one to the other effortless. Unlike some online Photoshop alternatives, Photopea is an HTML5 web app, so will run in any modern web browser without the need for plugins. In terms of looks, it's very similar to a slightly older version of open source desktop photo editor GIMP, which is no bad thing. It's clear, all its tools are easily recognisable, and its menus are arranged in a logical order. You can work on several images simultaneously, and switch between them with handy tabs. Like all the best online alternatives to Photoshop, Photopea supports layers and masks (both raster and vector). There's the usual complement of brushes and color editing tools, filters, and advanced text editing tools for design work. A Photopea subscription will remove the site's ads and give you the opportunity to send the developers your feedback, but the free version is extremely impressive. It's hard to believe such a powerful tool is actually a web app. Pixlr Editor can open all the most popular image file formats, including PSD. It can export as JPG, PNG, BMP and its own layered PXD, though sadly not Photoshop's native format. Pixlr Editor is one of the most accessible online Photoshop alternatives around; it's available in 28 languages, and has a comprehensive FAQ. The only significant downside to Pixlr Editor – and the one that keeps it from the top spot – is the fact that it's based on Flash and its developer has indicated that it will be making the shift to HTML5 at some point. We don't know what this will mean for the future of the powerful online photo editor, but many other tools have become far slimmer after making the change. We hope Pixlr Editor won't lose any of its shine, but we'd advise having some of the alternatives here bookmarked for future use just in case. Polarr is available as a premium desktop tool and a free web app. As you'd expect, the web version has some limitations, but it's still one of the most powerful alternatives to Photoshop you'll find online. Polarr gives you a choice of 'Express' and 'Pro' layouts, the latter of which most closely resembles Photoshop. The interface is clean, and although some of the icons might be a little confusing at first (the one for uploading your own photo looks like is should be a download button), there are tooltips on mouseover that make everything clear, as well as keyboard shortcuts – a rare feature for a web-based photo editor. There's also a selection of 'guides', which are step-by-step tutorials that explain how to achieve a particular effect, such as selective coloring or dehazing. Editing is non-destructive, and you can reverse any edits in the History panel whenever you want to. Polarr's save options are particularly impressive. You can export in JPG, TIFF or PNG format, apply your own watermark, choose from three quality settings, and resize the image if you want. You can even strip or edit metadata. Batch exporting and saving of presets are only available if you've paid for a premium subscription, but Polarr's free offering is extremely impressive once you've mastered its unusual workflow. Sumo Paint is Flash-based, so you'll need to download the relevant plugin and grant access before you can use it. 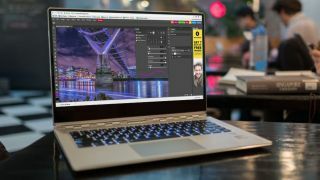 As the name suggests, it puts a heavier emphasis on creating your own artwork from scratch than the other online Photoshop alternatives listed here, but it's still a solid choice for a spot of editing in your web browser. Sumo Paint supports layers and offers a huge range of ways to manipulate them, but doesn't offer masks at the moment. Where Sumo Paint shines its its huge choice of highly customizable brushes, with adjustable size, orientation, scattering, gravity, plus other options such as random rotation, smoothing and wet edges to create realistic paint effects. Another of Sumo Paint's great features is the ability to save your creations to its cloud servers. You'll be provided with a link that makes it easy to share your work online, or in emails. A Pro subscription will remove ads from the site, but they're unobtrusive and unlikely to spoil your enjoyment of this browser-based alternative to Photoshop. Photo Raster isn't a limited edition of a free tool. Instead, its creators request an email address in exchange for a free license key. If that's a price you're willing to pay, read on. Like Photopea, Photo Raster has a great deal in common with GIMP, but is sadly unable to open or export PSD files. It does, however, have the expected range of editing tools, filters and brushes. Unfortunately, Photo Raster isn't as stable as the other online Photoshop alternatives listed here, and although it was generally reliable in Safari and Firefox, it occasionally froze during our tests in Chrome. Its creators advise that it's currently a development version, so although it's not polished enough to become your main photo editor at the moment, it's definitely one to keep an eye on in future.